Thursday 21st March 2019 saw DEFRA publish data relating to wildlife controls, that form part of the government’s programme of bovine tuberculosis eradication. Of particular interest is bTB surveillance data from the first year of badger control operations in eastern Cumbria. BVA responded to DEFRA’s consultation on the proposals in 2018. “We continue to support a comprehensive and evidence-based approach to tackling bovine tuberculosis (TB), including the principle of badger controls within the Low Risk Areas (LRAs) of England where there is a demonstrated need. We welcome this evidence, which demonstrates that there was significant bovine TB infection in the wildlife reservoir in the Cumbria hotspot and that whole genome sequencing has shown this to be the same strain that is present in cattle in this region. Clearly it is not yet possible to assess how effective the culls have been in containing that threat. “Bovine TB is a devastating disease and it is vital that we use every available tool in the toolbox to support the Government’s aim to make England bovine TB free. We are pleased to see the expertise of veterinary and scientific colleagues in government being fully utilised in Cumbria, with a strong focus on surveillance and the application of whole genome sequencing and epidemiological analysis. Only by better understanding bovine TB and applying that evidence to the eradication process can we hope to be successful in halting its spread. “We continue to call on the Government to use the targeted and humane method of cage trapping and shooting only, rather than the current method of controlled shooting. This report emphasises the additional benefits of cage trapping as a method in that it allows better analysis of the culled badgers, leading to an improved understanding of the relationship between infected wildlife and disease spread in cattle. TB surveillance was conducted in badgers removed from one badger control intervention area in the Low Risk Area of England. 40 out of 363 tested badgers (11.0%) were positive for Mycobacterium bovis, all with the 17:z genotype previously identified in this area. The prevalence was 20.9% inside the previously designated central “Minimum Infected Area”. The surveillance expanded on previous knowledge of badger infection in the area, where surveillance was carried out in ‘found dead’ wildlife carcases as part of the enhanced measures initiated in a potential hotspot of TB infection. A cluster of bovine TB cattle herd breakdowns emerged in the Low Risk Area of England in eastern Cumbria. A potential hotspot area was declared (Hot Spot, or HS, 21) and cattle, non-bovine animals and wildlife were subjected to enhanced TB surveillance from September 2016. The genotype of M. bovis (17:z) associated with HS21 had not previously been identified in cattle herds in Great Britain. Current investigations have concluded that disease is most likely to have been introduced by cattle imported from Northern Ireland. From identification of the index case in November 2014 to 13 February 2019 there had been a total of 35 breakdowns across 31 holdings. an outer cull area, previously known as the buffer zone, also based on estimated average badger social group territory size surrounding the minimum infected area, to take into account the possibility that infection may have already spread in the badger population. The boundary was adjusted to adhere to natural barriers to badger movement as far as practical to minimise the risk of any possible perturbation effects. Badger control operations began within HS21 in September 2018, formally referred to as Area 32 – Cumbria. These were deemed safe, effective and humane by Defra’s Chief Veterinary Officer in the summary of operations published in December 2018. Further details of the outcomes of the operations can be found in the report titled ‘Summary of badger control monitoring during 2018’. In the 2018 operations, 602 badgers were removed from the badger control intervention area. Of these, 205 were controlled shot and 397 cage-trapped. There were 169 removed from the MIA and 322 from the outer cull area. A further 111 were removed from parcels that spanned both the MIA and outer cull area. As part of the operations, APHA carried out TB surveillance on culled badger carcases with the goal of contributing to information for future operations in the area. In general, controlled shot badgers are unsuitable for TB surveillance; therefore sampling focused on cage-trapped badgers. Targeted post mortem examinations were conducted and tissue samples taken and cultured in an attempt to isolate M. bovis. Genotyping and whole genome sequencing was then carried out on any isolates. This resulted in 354 cage-trapped and 15 controlled shot carcases being sampled, a total of 369. Of the sampled carcasses, 40 of 363 were positive for M. bovis (11.0%) and 323 were negative. Six further cultures are still pending. Of the infected badgers, all are genotype 17:z, the novel genotype associated with HS21 and originally identified in cattle. 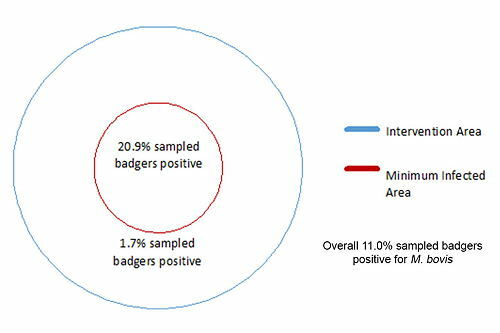 In the MIA, 20.9% of sampled badgers tested positive (37/177). Positive badgers were found on over 44% (15/34) of the MIA land parcels that submitted a badger for sampling. In the outer cull area, 1.7% (3/173) tested positive, on 6% (3/51) of land parcels that submitted a badger for testing. There were also thirteen negative badgers found on six land parcels which spanned both the MIA and outer area. The results presented here, alongside the ongoing intensive surveillance of cattle and ‘found dead’ wildlife, will inform future control measures in both badgers and cattle within HS21. APHA is continuing to test ‘found dead’ badger and deer carcases in HS21 reported through the Defra Rural Service Helpline (03000 200 301).